Prince’s Plot is adjacent to Mill Lane in Charminster and covers an area of approximately half a hectare. The Parish Council purchased the steeply sloping site at auction when the Budden Estate, of which it formed a part, was sold off in the summer of 1997. It was made possible by generous donations from local residents. The site lies below the line of Charminster Public Footpath number 2 which runs along the top of the hill. An unofficial footpath worn from top to bottom of the plot links footpath 2 with Mill Lane. Access gates (a field gate and pedestrian gate) have been installed from Mill Lane giving easy access and the footpath has a gate through the hedge on the top boundary of the site. 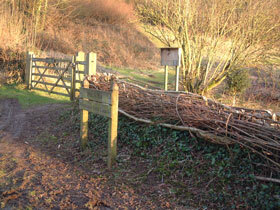 A further new pedestrian gate has been added to the southern boundary linking in with the existing right of way. In the 1940’s the field was used to keep a shire horse named ‘Prince’, well known locally for his exhibition at local shows. This is the last known use of the field and the site is named after this former occupant. The management of the site involves maintaining this small fragment of chalk downland by reducing scrub, whilst maintaining a broad habitat for wildlife. A small amount of tree planting has taken place on the fringes of the site. An area of 15 or so trees were planted by Charminster School children on the bottom SW corner of the site. Oak, horse chestnut and beech trees have also been added. Nest boxes built by the scouts have been put up on the field. In 2004 the site was put forward and given the formal status of “Local Nature Reserve”. This is a non-statutory designation of a site of local nature conservation significance, declared by local planning authorities. 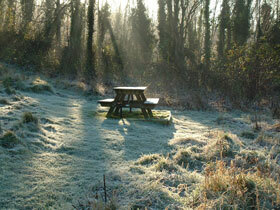 A Local Nature Reserve (LNR) is for both people and wildlife. They are places with wildlife or geological features that are of special interest locally and offer opportunities to study or learn about nature or simply to enjoy it. There are 33 LNRs in Dorset. The site is a valuable community and educational resource. We hope you enjoy it.